WAKE UP IN THE SMOKY MOUNTAINS! Rent a 1 or 2 bedroom cabin and enjoy top quality resort amenities such as indoor & outdoor pools, sauna, hot tub, activities and exercise center. Enjoy hiking trails, state parks, waterfalls and restaurants close by. All have screened-in porches with heat and air. Two cabins are pet friendly. One cabin is handicap accessible. 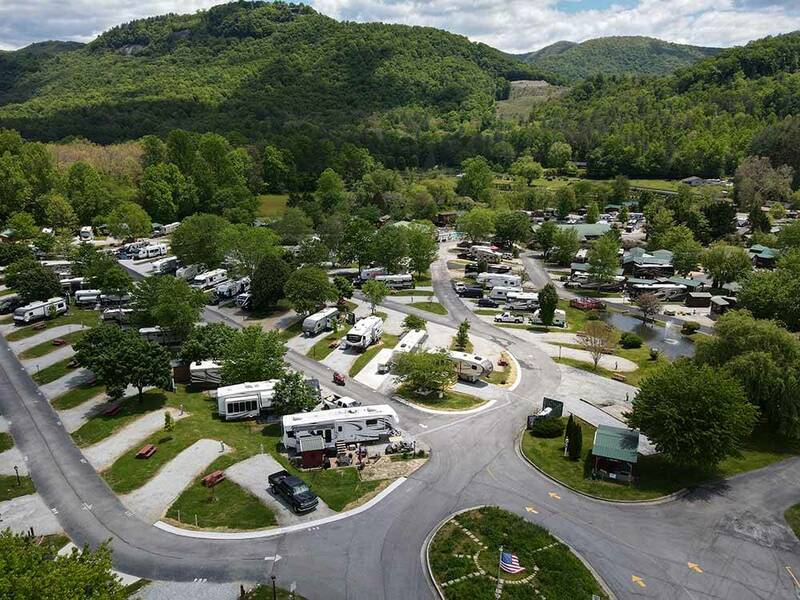 Very nice RV park located in North Georgia. Very convenient for day trips to Helen, Georgia and the Highlands area in North Carolina. Close to the Dillard House Restaurant and the Cupboard Café which are very good. Our stay was very nice however we were there during a Holiday Rambler Rally so everything was geared around them. Did not use any of the facilities due to rally groups. Many sites are privately owned. Overall, nice park. We stayed in site #584 which backed up to the road going to Highlands. Very busy and noisy during morning time. We will stay here again when we are in the area. This is the perfect spot for making day trips to North Georgia and southern North Carolina. The sites are level and well maintained. Many of them are privately owned but that means in some cases that there have been improvements to them. Our site had a nice deck with extra landscaping and path lights. The pool area/community center is where everything happens and there is also an adult only indoor pool. The only thing that keeps me from giving them a perfect score is the wifi which is spotty and slow. But it's a wonderful location and we will be back! Clean facility, quiet, beautifully nestled in the valley, with mountains surrounding. Only negative is the wifi, intermittent service, at best. Overall, a very nice campsite, and we will stay here again in the fall. Pros: - Location just minutes from antique shopping, Dillard House, mountains and rivers, and state parks. - Clean amenities, community areas, and bathrooms. - Indoor heated pool for cold months is terrific. - Good playground for kids. - Little pond is perfect for letting the kids feed and watch the fish. - Most sites were level and had plenty of personal space. Cons: - Some sites are in runoff areas and stay flooded even after a few dry sunny days. We found this out the hard way after setting up on a rainy day followed by three dry days. The algae growing on the gravel should have been a clue, but I didn't see it the day I unhooked the truck and set up. We were unfortunately living in a swamp and couldn't even get to our picnic table our walk around the camper without walking through a lot of mud. - The community grills are gas, which is nice, but are most are either not working or missing parts, like the grate or a burner. - No fire pits or rings on the sites, but the community fireplace was close and a nice place to spend the nights meeting fellow campers. This is a beautiful, well kept campground! Every staff member that we had contact with went above and beyond to do anything we asked! I would stay here as much as I could afford! The restrooms were always clean, as well as the showers! The pool was kept very clean! The activities that were planned when we took our grandchildren on Spring break were great! I could find not one thing wrong with this park! The only reason we are not staying there on our annual October camping trip is because the cost was too high for us. We will stay off-season as much as we can! Outstanding experience with River Vista. Great park, great amenities and great location to explore areas in this region of the Georgia/North Carolina mountains. 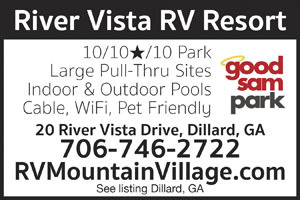 Well maintained RV sites, nice people and very good prices.One of our favorite parks ! Rent a Cabin in the Northern Georgia Blue Ridge Mountain Range & enjoy top quality resort facilities. Fun activities both at the park & at nearby forests, lakes, and waterfalls. Cool temps & access to hiking trails.